What exactly is a real sport? 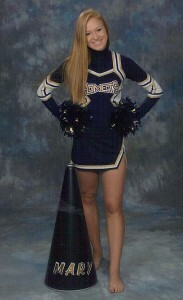 Cheerleading definitely has all the qualities of a sport such as strength, agility, endurance, teamwork and competition. Many say that cheerleading is nothing but a distraction to real players. Others say that cheerleaders have what it takes to be real athletes. Cheerleading does meet the dictionary definition of a sport. Going behind the miniskirts and the glittery makeup, you will see a very strong athlete who has confidence, courage and a high spirit. Cheerleading is a sport, I can prove it. Cheer practice will usually last around two hours every day, depending on the school. Practices include exercising and stretching, developing a dance routine, tumbling and of course cheering. The length and intensity of the practice is comparable to many varsity sports practices. Cheerleaders at competition and cheerleaders at football games are very different. Sideline cheerleading at a high school football game? Not a sport. Professional cheerleaders at NFL and NBA games? Not a sport. Competitive cheerleading with tumbling, stunting, and dance that requires stamina, strength and endurance? A sport. The miniskirts and pompoms are just uniforms. At competitions, cheerleaders show off everything they have learned while representing the school they attend. It’s just like every other athletic sport, giving 100 percent effort, and showing what they are made of. Competitive cheerleading can be seen on the sports programming network (ESPN). The skills involved in cheerleading leave no doubt that cheerleaders are exceptional athletes. To perform their activities, they must be as strong as any football player, as poised as any dancer and as flexible as the best gymnasts. They are athletes by every definition of the word. Cheerleading is definitely a real sport. so i assume if you call cheerleading a sport you also consider marching band a sport because members of the band work at least as hard as any cheerleader or football player. i agree…. colorguard and marching band works ust as hard as anyone else. its time we get reconition for it. i do not agree with you the big drum… football players and cheerleaders work hard physically, pushing there-selves to the limit in practices and games. Although bands have to memorized notes and things, Football and cheerleading is physically harder and more energy draining. if i can flip a 100 plus tire up and down a basketball court and a hill at comet field, i think i can hold a 40 pound drum…i probably think i could walk 10 yards in three seconds too. I’m pretty sure athletes are in better physical shape then the band members, it only makes sense. I have to agree with jaq. Im in the marching band, but i dont think band members really realize how hard an actual sport is. Big Drum I know for a fact that the band works hard and like any other sport it takes years of practice to learn how to pay an instrument as well as learning how to be an amazing athlete. Both practice just as much as the other and win and lose the only difference between band and another sport is we don’t pick the people we want in band we have everyone who wants to play music. we let people who have never had anything the joy of winning first place. plus we have a lot of funny stories and memories that will never die. the last time i checked the band and color guard can’t stop after every couple notes they play like sports teams can. football they do one play then stop and then do another one band we have a 10 minute show and most of the time we are running across the field. plus if you would test the physical ability endurance and lung capacity of a football player and a band member the band member will do better in all of them. This conversation is complete fail. It’s pretty much all about the money. it is a sport of the arts…. 1.an athletic activity requiring skill or physical prowess and often of a competitive nature, as racing, baseball, tennis, golf, bowling, wrestling, boxing, hunting, fishing, etc. a particular form of this, especially in the out of doors.